It works on Arduino IDE as it supposed to be. 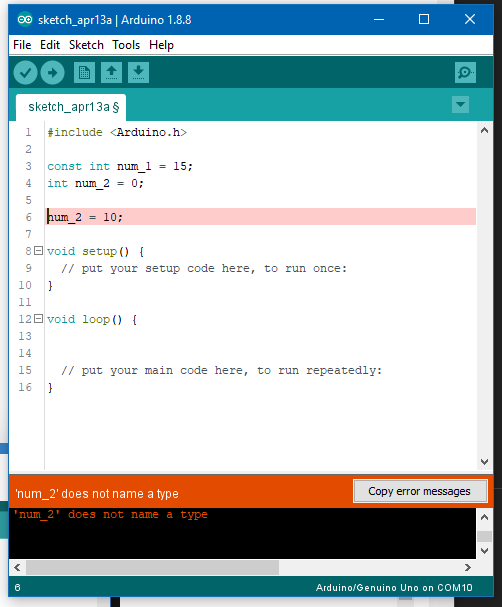 I think there are some differences when you code in PlatformIO comparing to Arduino IDE. I’m not sure why it compiled in the IDE, but the statement that’s giving you an error needs to be inside a function so that it can be executed, such as setup(). I think you’ll also be surprised that it actually doesn’t work in the Arduino IDE as listed! But yes, the statement in question on line 6 is invalid - anything other than the initial assignment should be inside a function… either setup(), loop() or some other one you write.